What about Belgian frozen vegetables? For centuries it was a challenge to preserve food for longer periods. The development of the tin can brought about a revolution. From the 1880s the canned food industry in Belgium expanded. 100 years later however, the Belgian canning industry stagnated and another type of fruit and vegetable processing emerged, i.e. freezing vegetables. The frozen vegetable sector underwent a spectacular evolution from the 1970s. Close interaction between agriculture and industry was the recipe for an unequalled economic dominance. Most frozen food companies opt for vertical integration: cultivation, processing, packaging, storage, transport and sales take place within one and the same company. The sector is ready for the future through continuous investment in product innovation, quality, environment, hygiene and technology. A temperate maritime climate and a favourable soil composition make Belgium an ideal region for growing vegetables. The central position in Europe, combined with extensive transport facilities (road, water, rail), provide efficient export opportunities. The processing companies are located in the centre of the fields where the vegetables are grown. This ensures shorter transport times, which has a positive effect on the quality of the end product. Belgium can be considered to be the ‘vegetable garden of Europe’, also thanks to the fast growth of the frozen vegetable sector. 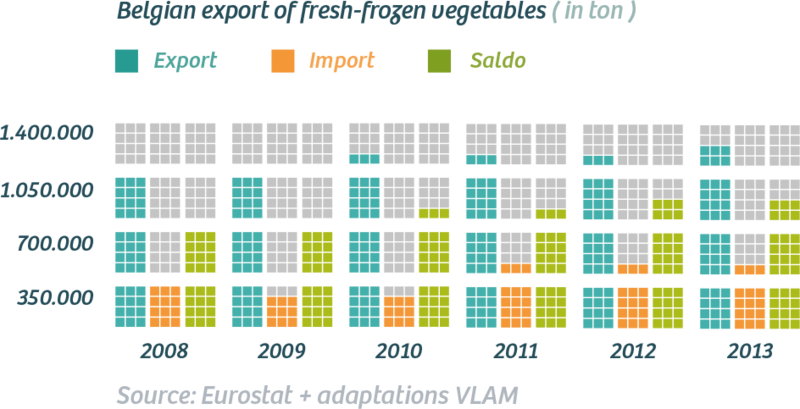 With its 10 companies in Belgium, the Belgian frozen vegetable sector represents one third of the overall European fresh-frozen vegetables production, of which the majority is exported all over the world. Every year approximately 50,000 ha of vegetables are grown for the Belgian industry, which are contracted directly or by means of intermediate trade with farmers and vegetable growers in Belgium, the Southern Netherlands and North France. With regard to quality, the Belgian frozen food industry is a pioneer in Europe. For example, the sector was closely involved in an integrated quality system from field to plate by means of the “Integral Chain Quality Control” (ICQC) standard for primary arable crops (www.vegaplan.be) and the “self-audit guide for the PVF (potatoes-vegetables-fruit) trade and processing” (www.gidsac.be). Both systems can be certified by external inspection bodies and they have been approved by the Federal Agency for the Safety of the Food Chain (FASFC). The sector is also heavily committed to increasing automation of the production processes and continuously invests in innovative technologies in order to maintain the quality and differentiation of vegetables at the highest possible level. All vegetables are accompanied by an identity document with which the vegetables can be fully traced. The document provides detailed information on product identification, cultivation plot, seeds selected, sowing date, irrigation levels, application of fertilisation and other treatments. Planet, People, Profit: the continuous search for ecological, socially responsible and economically feasible methods for cultivating, processing and storing fresh-frozen vegetables. Measures to reduce the amounts of water necessary for irrigating the vegetables. The geographical zone is chosen in such a way that fields have to be irrigated ‘artificially’ as little as possible. Efforts to limit the use of water during processing and to recycle the water used. Reducing the CO2 footprint, including improved logistic and transport systems. Reducing energy consumption, re-using heat, decreasing losses as much as possible, sorting waste, etc. All residues (non-processed vegetables, waste after cleaning the vegetables, etc.) are recycled, mainly into cattle feed or fertilisers for the fields and, to a lesser extent, for renewable energy. • Fresh-frozen vegetables are only grown during their optimal growing season, but can be eaten throughout the year. So there is no chance of food spoiling. • With frozen vegetables, consumers can take the exact portion that they require. Therefore there is virtually no waste in the fresh-frozen chain. In fact there is only ‘unavoidable’ waste, such as peelings or stalks, but they are removed right at the beginning of the chain. • Vegetables which are not perfectly shaped are processed. The various applications and cuts, permit these vegetables to be put to good use and are not counted as losses. 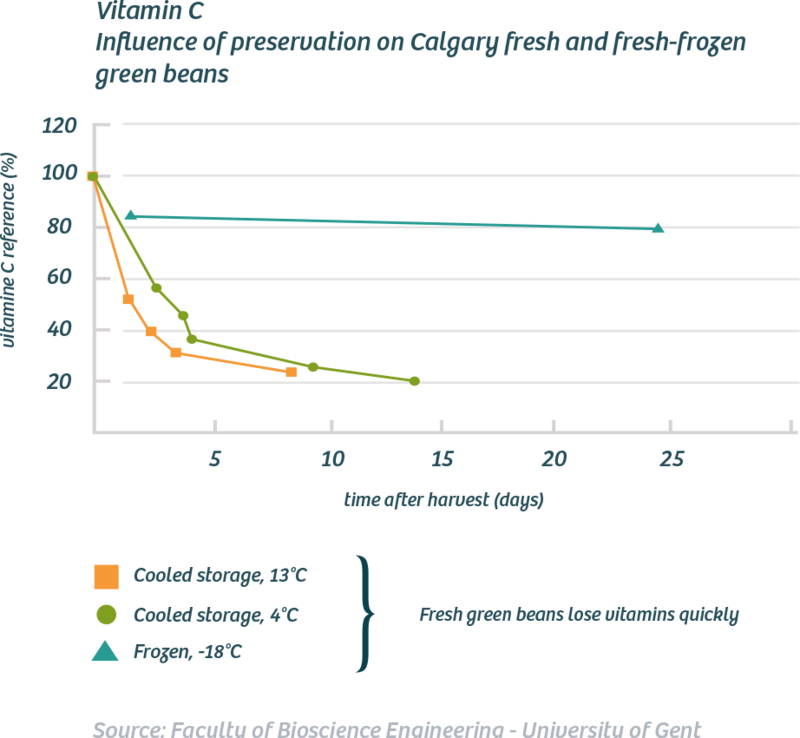 There is a maximum of 2 to 5 hours between harvesting and freezing the vegetables. In this way the nutrients (vitamins, minerals and fibres) and taste of the vegetables are optimally preserved. Fresh-frozen vegetables do not contain any preservatives. Blanching inactivates the enzyme activities responsible for the growth, and therefore also the spoiling of the vegetables. The preservation process of blanching and then freezing, locks in the freshness and ensures the conservation of the vegetables. Fresh-frozen vegetables come ready-cleaned. This greatly simplifies the preparation of meals. Fresh-frozen vegetables are available throughout the year and their natural taste is maintained. Every day this offers many ways of preparing them, regardless of the season. Fresh-frozen vegetables are easy to measure out. Only the required amount is used. Fresh-frozen vegetables are profitable: one kilogram of processed vegetables is actually one kilogram of edible vegetables. Undoubtedly Belgian fresh-frozen vegetables have many assets and are a practical solution in everyday life. Fresh-frozen vegetables guarantee a combination of healthy food, convenience, natural taste and sustainability.